Since 1993 Aeros has been producing Target, the hang glider for the beginning pilots, which undoubtedly has been ideal wing for learning, soaring and fun flying. During the years of exploitation Target has established a reputation as reliable training hang glider. APEN 6 sail cloth option. The Fox’s frame is made with 7075 alloy tubes, which is lighter than 2024. The weight of the wing is reduced for almost 1 kg! The A-frame is made with Finsterwalder uprights and fittings, the same as Discus A-frame. Fox has got new sail design: in additional to general sail refinements, the rear edge is changed to comfortable Airborne batten tips. 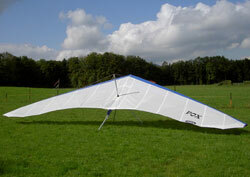 The composite X-lam cloth APEN 6 is now available as sail option for those, who is looking for a splendid view. The cross-beam and rear upper wire is tensioned in one movement. The Fox hang glider has been certified at DHV! Obedience and controllability at landing. Fox – make easy start on your way to masterly flying Combat!